When Apple unveiled the iPad in January of 2010, it left a gaggle of other consumer-electronics companies suddenly anxious to get into the tablet game. Very, very anxious. So anxious, in fact, that some of them set deadlines for themselves that made it impossible to ship fully-baked products. That was certainly true of Samsung's original Galaxy Tab, which ran an operating system designed for phones, not tablets. And Motorola's Xoom, which debuted without several of its key features and with a buggy version of Google's Android Honeycomb operating system. And RIM's BlackBerry PlayBook, which was just a mess. HP, however, came off as less frantic than its peers. True, it plunked down $1.2 billion a year ago to buy mobile-computing pioneer Palm and its excellent WebOS operating system. 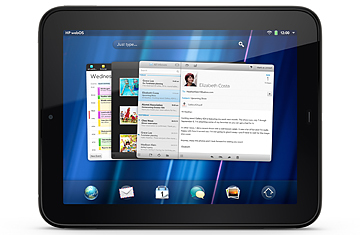 But then it announced that its first WebOS tablet, the TouchPad, wouldn't be ready until this summer. It's an important product  the flagship of an entire fleet of WebOS gizmos that HP says is on its way, including phones, printers, PCs, additional tablets, and maybe even products manufactured by other companies. Wait for the TouchPad until HP could release something that felt refined, not rushed? That didn't feel like an imposition  it sounded like a great idea. The tablet starts shipping this Friday. For the past week, I've lived with one that HP loaned to me. And while I found lots to like, I also discovered that the extra time that the company took hasn't paid off in a perfectly polished product. Actually, the TouchPad I've been using is downright buggy, and suffers from a shortage of key apps. Which is why my advice to anyone who wants to buy a tablet right now remains unchanged: Get an iPad 2. That recommendation isn't set in stone. The TouchPad that early-paying customers receive will be at least slightly better than the one I tested: HP says that several notable apps which I couldn't try will arrive at the very last minute. (Among the stragglers are programs for downloading music and movies, along with digital editions of TIME and sister mags Fortune, People, and Sports Illustrated.) The company is already working on a software update intended to make the tablet more spritely and less quirky, and reports that useful features such as the ability to edit word-processing documents and spreadsheets will be along soon. The TouchPad shows several telltale signs that its design was hatched way back during the era of the original iPad. Encased in black plastic, it's .52" (13.7mm) thick and weighs 1.6 pounds (740 grams)  just a shade more portly than last years iPad, but noticeably chunkier than the iPad 2 and Samsung's Galaxy Tab 10.1. It's got a 1.3-megapixel video camera on the front, which is nice  except that it's typical for new tablets to have cameras on their backsides, too. See the best blogs of 2011.